Shri Hansmukh Lal Golia and Smt Chandrakala Devi were very happy to have a child. They named him Devendra. Born in a religious family, child Devendra grew up with all the righteous influences.The mother has given many good qualities to him.But early in his childhood, his mother passed away. The event changed the childs life forever. The effect of this sad event made Devendra too serious for his age. His father was worried to notice the sudden change in his sons state of mind and sent him to Jaipur, to his maternal family. Even this didnt bring any change in the child. The ephemeral nature of the world had made a deep impact on him. By coincidence, he had an audience with Sadhvi Shri Vinay Shriji. Her inspiration strengthened Devendras yearning to discover the true meaning of life. 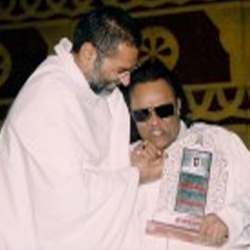 At the young age of 15, he was initiated as Yati by Acharya Shri Dharnendra Suriji and given the name Chandroday Gani. 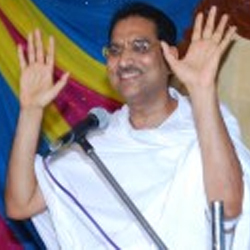 Child Devendra and after initiation Chandroday Gani learned Satya Sadhana under the able guidence Guru Yati Shri Jatan lalji Maharaj.For over 2 years he studied the Jain Aagams (Scriptures), Vedas, Puranas, the Bhagwad Geeta.He also learnt Sanskrit, Prakrit and achieved a fluency in these languages. Meanwhile, the Bara Upasara (Jain religious seal) of Bikaner had been vacant since eight years and awaiting a new successor to the Pujya Acharya Shri Vijayendra Suriji. In fact, Shri Vijayendra Suriji had made a prophecy that his successor would be much more prodigious and gave a clue of his successor. Everyone was eagerly waiting for the new successor. Several saints came to grace the Holy Seat but were unable to do so. Their wait ended on 13th Magh Shukla 2028 Vikrami. 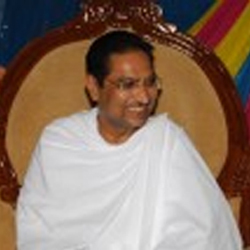 Shri Chandroday Gani, at the young of 17, sat on the Holy Seat and was bestowed the title of Acharya. He was also named Jin Chandra Suriji as per the 1000 year-old ancient tradition of naming every fourth successor as Jin Chandra Sur. Acharya Jin Chandra Suriji undertook long journeys within the country to propagate the Jain religion and its philosophy. Acharya Shri Jin Chandra Suriji started practicing meditation from the initial days of his childhood. And later on named it as Satya Sadhna. He felt Satya Sadhna deserved to be spread and propagated to a larger section of the society because of its immense benefit to the world. Thus was born Kushlayatan, at Nal, Bikaner as it is called, today houses the Satya Sadhna Kendra (Meditation Centre), Kushal Vidyapeeth (School), the Kushal Aushdhalay (Health Centre), and a bird sanctuary. Kushlayatan, P.O. Nal - 334005, Bikaner, Rajasthan, India.